This 2-reel Western wraps up my exploration of D.W. Griffith’s early shorts. 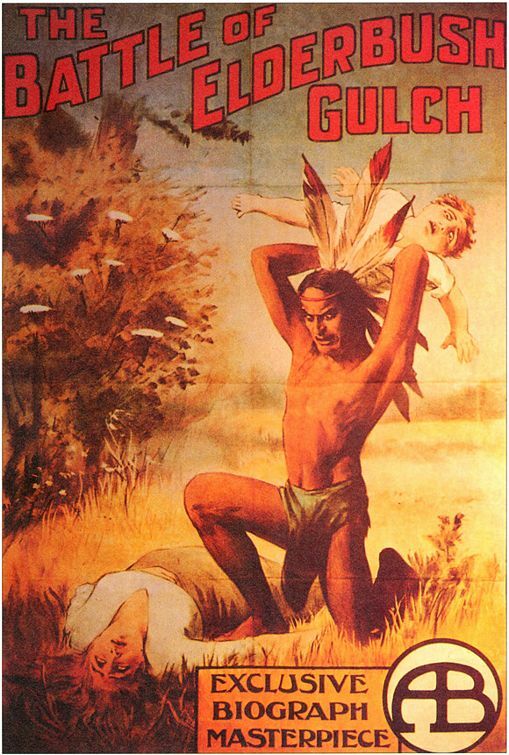 Unlike “The Massacre” and other examples, this movie has no narrative of sympathy for Native Americans, using them as truly stereotypical villains – the poster seen above is vividly accurate, and could only be embellished if the “Indian” in the image had a half-eaten puppy in his mouth. The story is that two orphans (one of them is Mae Marsh, who appeared in “The New York Hat” and “Birth of a Nation”) arrive in a settlement town with their puppies, but are told by their strict uncle to leave them outside. One goes to see that they are OK, and finds two natives stealing them for a feast. The uncle comes to the rescue, and shoots one, who happens to be the chief’s son. This brings the whole tribe down on the village, and puts the one baby in town (its mother is Lillian Gish, from “The Mothering Heart” and “Intolerance”) into jeopardy, until the cavalry rides in. The baby is saved by one of the “waifs” and everyone seems happy at the end, despite the fact that the stinginess of one man has caused the deaths of dozens on both sides. It doesn’t seem to me that Griffith really needed the longer format to tell such a cliché story, although the battle scenes are undeniably impressive. Starring: Mae Marsh, Lillian Gish, Alfred Paget, Robert Harron, Henry B. Walthall, Kate Bruce.